This is the most critical part of IO Integration services. Our consultation experts help you make sense of chaos. We know you’re using a number of marketing technologies in your organisation and often the most difficult thing is making sense of what you already have. You might have identified a need, but you also want help understanding the overall technology environment and if yours is working as it should. This consultation process ensures that you understand what you have and what you need. Our consultants can help analyze workflows across departments, identify common denominators, and put together a plan for how your organization can move forward and modernize your technology infrastructure. 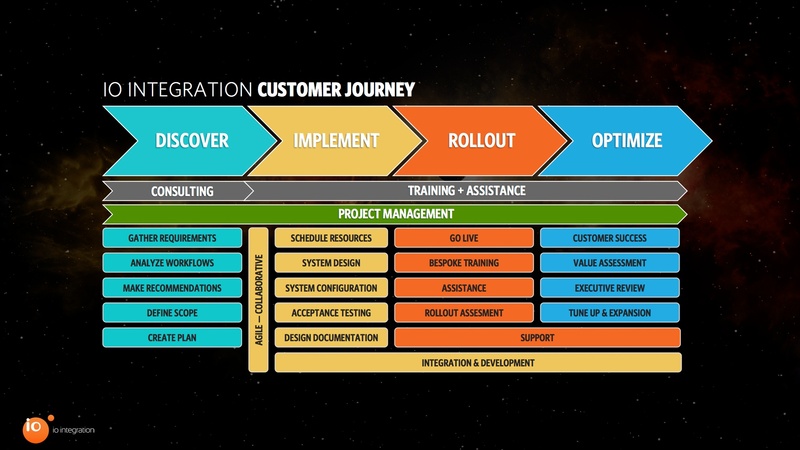 It’s important to remember that consultation services from IO Integration are completely agnostic. We help you cut through the noise, take an objective and holistic look at your ecosystem, and recommend the best course of action. Whereas consultation takes an overall view of your organization and technology, our discovery services are focuses on a specific area, technology, or workflows. Once a need has been identified, for example improving efficiencies in the creative production department, our discovery team will go in and take an in-depth look. The purpose? To identify pain points, see where inefficiencies lie, uncover challenges, and recommend ways to streamline your productivity. A successful discovery naturally leads to a solution design. At this point we’ve got a clear picture of what you need and can match a product to your requirements. Often this could mean a technology or a set of technologies that will meet the needs that we’ve identified with you during the discovery process. Our solutions architects and business analysts lend expertise here – designing the ideal solution and scoping out how your existing and new technologies will work together. This process is crucial to success and requires the expertise of the IO Integration team, as well as an element of collaboration from you, your stakeholders, and your IT department. Your solution has been chosen, designed and all the pieces are in place. At this point we’ll build the actual solution, bringing our turnkey services into the mix. We will build the solution from the ground up, combine all the pieces and ensure it’s all working before the rollout to the business. An important part of this process is the testing phase which will be done by you and your team, ensuring that all the requirements have been met, identifying and fixing any issues, and making sure once it gets released to the greater organization it is all working properly. Taking any new system live can be daunting, but by working with a team of experts like IO Integration you can ensure that rollout is smooth. Of course, if there are hiccups IO Integration is there to provide support and assistance. Training plays an important role here, empowering all staff to get the most out of the solution. 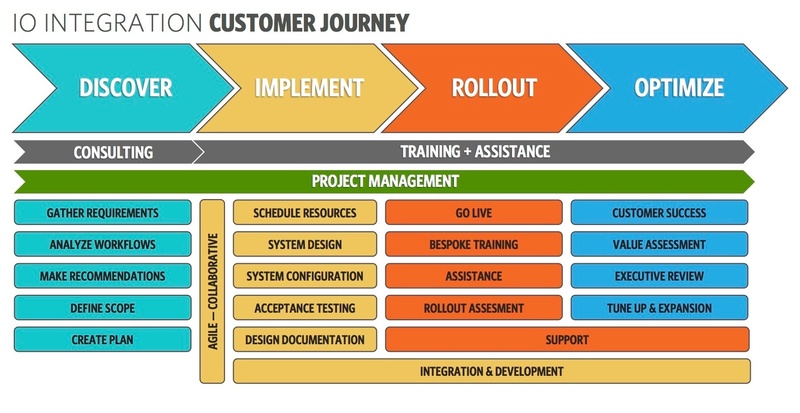 IO Integration training and assistance helps with change management, ensuring users understand how to use the solution and how it brings value to the organization. When you deploy for users, we provide assistance to make sure it’s going well. for all systems we deploy? Our job doesn’t end once the solution has been rolled out. For us, it’s about partnership, and keeping in touch. Our customer success managers will connect with your key stakeholders at regular intervals after rollout to ensure your solution is working as it should and delivering value. As user feedback is taken onboard, we help identify and fix issues and assist with change management. It also means that once your organization is fully realizing the benefits of the solution we can help create value reports that demonstrate ROI to upper management. This helps you communicate the value that has been created and helps you get approval for future projects. Contact us at any time to chat about where you are on your IOI customer journey.